From the live #Satchat with Brad, Scott, Bill & Daisy (live from her home in Arkansas and joining us through a Google HangOut) in the morning to the discussion about reshaping Faculty Meetings with Bruce later on to presenting with Joe (my brother from WI who I just met for the first time this morning) in the afternoon, the EdCampNJ experience was an AWESOME one that reaffirmed for me what PD for educators could be if we take control of our own learning! I had been reading about it, hearing about it and scanning tweets from the various EdCamps across the country for the last two years but until today, I never had the honor of actually attending one and all I can say is, BETTER LATE THAN NEVER! 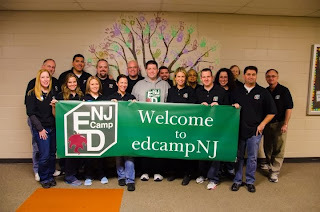 EdCampNJ is exactly what PD should be... MY choice, on MY terms, on MY time, in MY way and to help push MY thinking. That is exactly what today did for me. I was able to select from over 20 different sessions throughout the day and my biggest challenge was which learning sessions to attend... should I learn about Mindcraft? Standards Based Grading? Edmodo? Google Hangouts in the Elementary Classroom? Or should I offer a session and share something I am passionate about? The possibilities were endless and for the first time, I wasn't dreading the experience because I got to choose what I wanted to learn and if I picked something that didn't feel right after a few minutes, I could get up and find something else (and continue searching until I found the right fit). I was in complete control of my professional development experience - I had a voice in my learning! WOW - who would have thought that a professional development experience could be so empowering? Honestly, not me! I had heard all the stories about EdCamps but in my head I kept questioning the hype... was it really going to be that different than the typical PD experience? The standard workshop with the presenters just going on and on? The "shot in the arm" conference that would fade before I got back to work on Monday? How could the EdCamp model possibly avoid all these pitfalls (and many more I have not listed here)? Well, the answer is quite simple... the experience is rooted in the connections shared between like minded educators who are passionate about learning and doing what is in the best interest of children. That is what made this learning experience totally different than any other conference or workshop. No one HAD to be there. No one was letting PD happen TO them. No one was passively sitting through sessions in a disengaged way. Instead, a buzz filled the cafetorium from 7:30am and lasted all day to the last raffle prize was announced after 3pm. People were talking; people were sharing; people were laughing; people were teaching; and most importantly, people were LEARNING! All day, throughout every exchange and interaction, people were being influenced, shaped and informed. From my vantage point, that is another thing that made the EdCamp experience different - it was rooted in connections between people who shared a common passion and interest - the opportunity to LEARN! I was engaged all day and for someone who is impacted by ADHD, that is a big deal. I learned about how I could record a Google Hangout. I learned about how I could do an even better job of making our Faculty Enhancement Opportunities (that is what we call Faculty Meetings at our school) more powerful PD sessions for our staff. I learned about how to better brand our school. I learned about a bunch of tools and web based resources that could support a project based learning experience. The common thread that ran through all these learning experiences today at EdCamp? The connections... the connections with my peers, colleagues and friends... the connections that allowed me to discuss the endless possibilities... the connections that pushed me out of my comfort zone... the connections that helped me personalize the learning experiences throughout the day. That, from my perspective, is what made the EdCamp experience so much more powerful... the connections... the choices... the personalized learning opportunities! Although it was only my first EdCamp there are two things I know for sure... it will NOT be my last and it was arguably the best PD experience I have ever had in my 17 year career as educator! 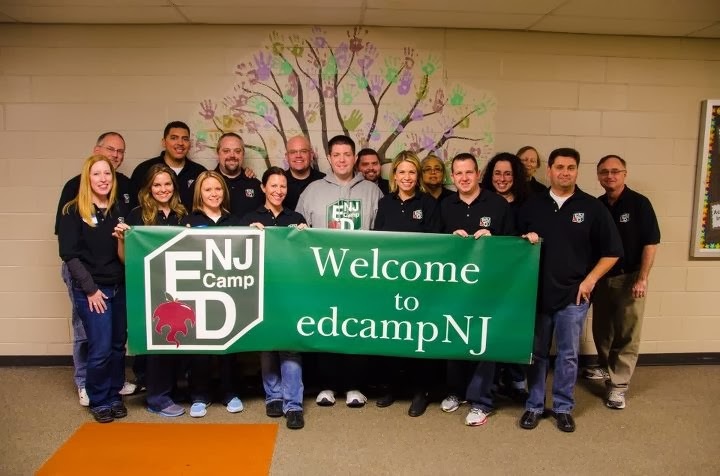 Thank you EdCampNJ for an EPIC experience! Wish I could have been there, Tony. If you want another EdCamp experience, there will be one in Madison January 25th. More of your #wiamigos will be there. It was great to have you at #edcampNJ! The experience that you shared above is the same one that I had when I went to my first edcamp (http://principalarc.blogspot.com/2012/06/iv-been-edcamped.html). The amazing thing is that I have been to several and helped organize both #edcampNJs and I still get that same adrenaline rush from connecting and sharing and learning in this fashion. Thanks for coming to my session and sharing your experiences. You are walking the walk as a lead learner. Be well and I hope to see you soon. Couldn't agree with you more! This was my first edcamp too and I wasn't sure what to expect. the passion, enthusiasm, and "buzz" was awesome. It was a pleasure meeting you yesterday and I agree - this will not be my last edcamp!